Listen to Tommy Collins singing "Shindig in the barn"
Leonard Raymond Sipes, better known as Tommy Collins, was born on a farm nearby Bethany, Oklahoma on Sept. 28, 1930. The youngest of five brothers he started picking up the guitar at an early age. After graduation Tommy Collins entered college with plans to become a chemical engineer. A job singing on Radio Station KLPR in Oklahoma City (his first professional singing job) interrupted the student life and halted his engineering plans. He recorded four songs for Morgan Records. In 1952, after spending a couple of years with the Marines, Tommy moved to California with the intention to make a living out of country music. Eventually he met a young man by the name of Ferlin Husky. At that time Husky was recording for Four Star Records under the pseudonym Terry Preston. It was Ferlin who introduced Tommy to Cliffie Stone, owner of Central Songs Inc., a leading publishing company of the west coast. Stone signed the Collins composing talent to a long term contract with Central Songs and it wasn´t long before Ferlin Husky, Faron Young, and a legion of other country artists were singing the songs of the young writer. 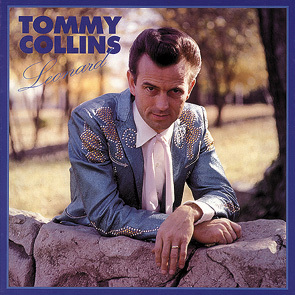 From the pen of Tommy Collins came such songs as "Are you afraid" sung by Ferlin Husky, "If you ain´t living" by Faron Young, "No love have I" by Webb Pierce, and "Down, down, down" sung by Rose Maddox. In 1953 Tommy stepped up to the microphone and recorded his own composition of "You gotta have a licence". This song immediately started his career as a country singer and skyrocketed him right into the charts. His most creative period both as a songwriter and a country singer were the years between 1953 and 1956. He turned out hit after hit. Buck Owens played lead guitar on his records at that time. His association with Buck Owens and Merle Haggard led to Tommy writing many hits for these artists. Buck Owens recorded a Tommy Collins album and Merle Haggard gave Tommy credit on one of his live albums. Tommy wrote "Roots of my raising" and "Carolyn" - major successes for Merle Haggard. In 1957 Tommy entered the Golden Gate Theological Seminary at Berkeley. After completing his studies at the seminary, Tommy did his first pastoring in Colfax, California, then accepted a position in Lincoln. Tommy had continue to record with Capitol Records, even while attending the seminary and pastoring. He recorded a gospel album in the end of the 50´s. Tommy moved to Nashville in 1976, a few years after his divorce from his wife Wanda. In spite of a lot of drinking and pill-taking problems he continued to perform, write and record. He recorded 3 LP´s for two English labels, GW and Password, the latter recorded in Nashville.